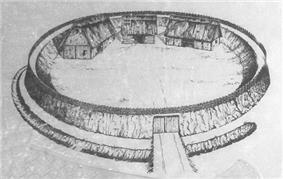 A circular rampart (German: Ringwall) is an embankment built in the shape of a circle that was used as part of the defences for a military fortification, hill fort or refuge, or was built for religious purposes or as a place of gathering. The period during which these structures appeared stretches from the Neolithic to the Middle Ages. The key feature of a circular rampart is the embankment forming the primary means of the defensive fortification. 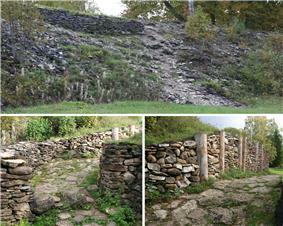 It can be constructed in various ways: as a simple earth embankment, as a wood and earth structure or as a wall. 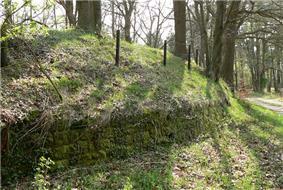 Circular ramparts usually have a moat or ditch in front of them; the embankment can be enhanced with a wooden palisade. Often several concentric rings were built, which produced a more effective defensive position against attackers. The interior of such sites often shows evidence of buildings such as halls, barns and other secondary structures. Circular ramparts have been discovered found in northern Europe, for example, in Denmark, Estonia, Sweden, Germany and Great Britain; in central Europe, in Austria and Switzerland; in southeastern Europe in Romania, Moldova and Ukraine; and also in the United States. They are often hidden in woods and discovered by aerial photography. Archaeological profiles through the defences and excavations of the interior enable analysis of the period the site was occupied, the pottery used and the type of food consumed.